Life is not measured just based on material things, but rather on pursuing God’s unique plan for one’s existence. Are you experiencing spiritual emptiness? How wide is the distance between you and the abundant life promised in God’s word? Can one truly enjoy abundant life in a world full of innumerable challenges? In his book, Five Keys to Abundant Life: Redefining Success in a Stressed Society, Pastor Emmanuel Eliason, explores the true meaning of abundant life from a solid biblical perspective and outlines five indispensable keys for unlocking the doors to abundant life. This book will equip you with knowledge as to how to seek God first, refocus your attention on the importance of speaking the word of God, rekindle your passion for prayer, discover the secret of sowing what you want to reap, and finally, challenge you to apply all these keys by taking action now! June 04, 2009: Given the lingering uncertainty of the times in which we live, we often find ourselves with more questions than answers. Economically, mentally, and spiritually, people as a whole are suffering in ways not seen for many decades, which has led countless individuals to engage in deep spiritual reflection, in search of permanent solutions for problems they hope are only temporary. Despite our best efforts, though, many of us have continued difficulty securing the comfort we seek, a problem which likely stems from the misguided approach that we take to the process. Thankfully, within the pages of Five Keys To Abundant Life, this misguidance is addressed and corrected in thoroughly comprehensive fashion. A inspiring new spiritual guide from Pastor Emmanuel Eliason, Five Keys presents readers with five simple, yet effective steps that they can take to improve their individual spiritual health and emerge victorious over the lingering adversity in their lives. Expounding on the virtues of constant prayer, sowing what you want to reap, and prioritizing our everyday actions, Eliason introduces a comprehensive plan for achieving the richness and fullness of an abundant, purpose-filled life. Rife with enlightening, cogent points, Five Keys is further bolstered by the extensive inclusion of biblical scripture and concomitant practical analysis. By highlighting his insights with applicable scriptural support, Eliason lends his teachings an enhanced credibility often missing from many of the spiritual self-help guides currently flooding the mainstream. Simple, practical, and powerful, Five Keys To Abundant Life is an essential analysis of the all-too common problems currently plaguing our collective hearts, minds, and souls. An eye-opening, revealing look into the real, yet often elusive solutions that we all seek. 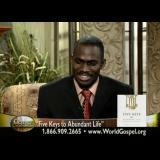 In "Five Keys to Abundant Life" Emmanuel K. Eliason presents five ways you can live a more spiritual life. This is not a book about becoming more financially prosperous although you may find that as you follow the principles in this book God blesses you and trusts you with more. There are some interesting ideas in this book like how reading the Bible out loud can be more effective. Pastor Eliason teaches the reader how to pray more effectively. He also explains why it is important to watch what you say and why you should be careful about what you sow as you will reap a similar crop of good or evil. Each chapter ends with points to think about and there is a section where you can write your own thoughts for personal reflection. The concepts in this book are easy to understand and easy to put into practice. Emmanuel K. Eliason is a natural teacher and you will benefit spiritually from the biblical principles he brings to your attention. Although Emmanuel Eliason's Five Keys to Abundant Life is a quick and easy read, it is also an important book that should be read by the masses. Paster Eliason open's the readers eyes with truthful messages for an abundant life. They are: seek the kingdom of God, speak the word of God, pray, sow what you want to reap, and take action. When the Paster speaks of abundance, he is not speaking of money. He is speaking of the fact that through God, all things are possible; however, we must actively and reasonably pursue the life we desire. For example, it makes no sense to pray for God to help us lose weight while we continue to live a sedentary lifestyle and eat in a manner inconsistent with weight loss. We need to walk-the-walk, not just talk-the-talk. One cannot expect people to like them and want to be around them if they whine, complain, bicker and frown all the time. We in deed reap what we sow. Don't expect to grow watermellon after planting apple seeds. Like the song says, "actions speak louder than words." Emmanuel's words are powerful because they are true and biblically based. Making these five keys a part of our daily life will make a difference now and eternally. Thanks for the great book Paster Eliason!